When I completed weaving a visor hat I was left with quite a few ends of prepared strips that I didn’t want to waste. They were long enough to use for a small project so I thought I’d weave a water bottle holder with them. 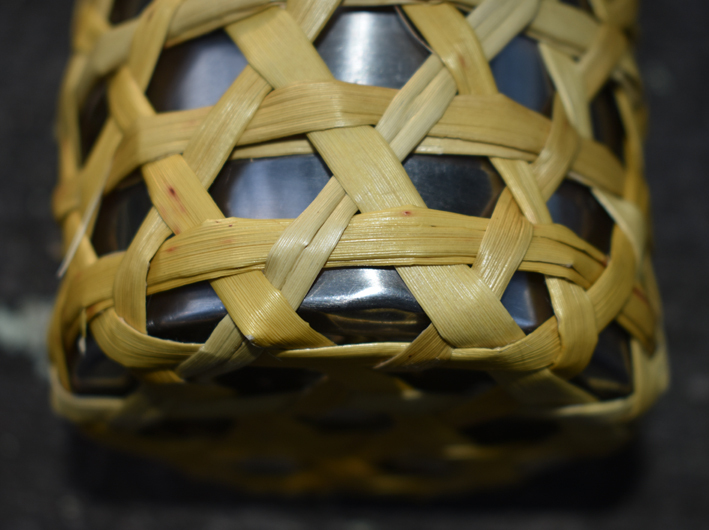 I started with hexagonal weaving but as the strips weren’t long enough to reach all the way up the bottle I carried on with plaiting, joining the plaits as they lengthened, ending with three plaits at the top. Before starting the plaits, I secured the weaving by tying overhand knots with each set of two strips at the point where the strips became too short for further hexagonal weaving. I shredded the ends of the knots and started plaiting each set, adding in shreds as required to keep the plaits reasonably even. As the plaiting progressed, I positioned them diagonally across each other and joined each alternate plait together to make one plait. I repeated this further up and ended up with three plaits at the rim of the bottle. It wasn’t necessary to join the plaits together as they grew longer, but I was in an experimental mood, and felt like trying out this idea. It worked fine and having just three plaits at the top also makes it easy to take the top off the bottle, although I did have to add the extra horizontal plait around the point where the three plaits start to ensure that the plaits sat at an equal distance from each other around the rim of the bottle. I extended the three plaits and then joined them into one plait over the lid of the bottle, plaited this a bit longer and added a loop in the form of a piece of water-smoothed shell. 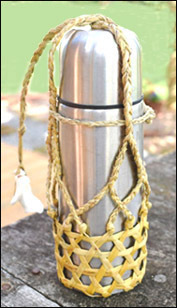 This makes a handy toggle for carrying the water bottle as well as hanging it up in a tree where the breezes blowing around the tree keep the contents cool. This was a fun exercise and although it’s not the neatest item I’ve ever made, it’s a useful piece of kit. 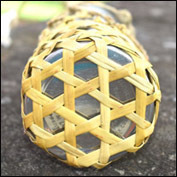 Hexagonal weaving is fun to weave and is well-suited to this project as it’s easy to move from the horizontal weaving of the base to the vertical weaving of the sides. Next time I’ll use longer strips and use hexagonal weaving for all of the holder. What would I do differently on this project? I’d shred the ends of the flax strips before I made the overhand knots at the top of the hexagonal weaving so that shredded flax could be added if needed to make the knots more even in size and I’d take more care with keeping the plaits even in width. Now, what will I make with the rest of the ends of strips I have left? I was wondering if you can tell me what is used to dye flax a white colour? I’ve not come across any dye for white and was hoping you might have some suggestions. Hi Monique, as far as I know there’s no white dye for flax.There are a couple of things I do. 1/ Choose a flax with white on the leaves and then just use the white parts of the leaves. 2/ Choose a flax that dries to as a white a colour as possible. To find this sort of flax, check Landcare’s website which tells you what colours different flaxes dry to. Some people use paint but this is not an option I use. 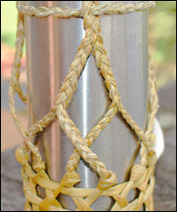 I am trying to make a bottle holder as above and cannot work out how to go up once bottom is done. Any tips/help would be much appreciated. Looks so tidy!